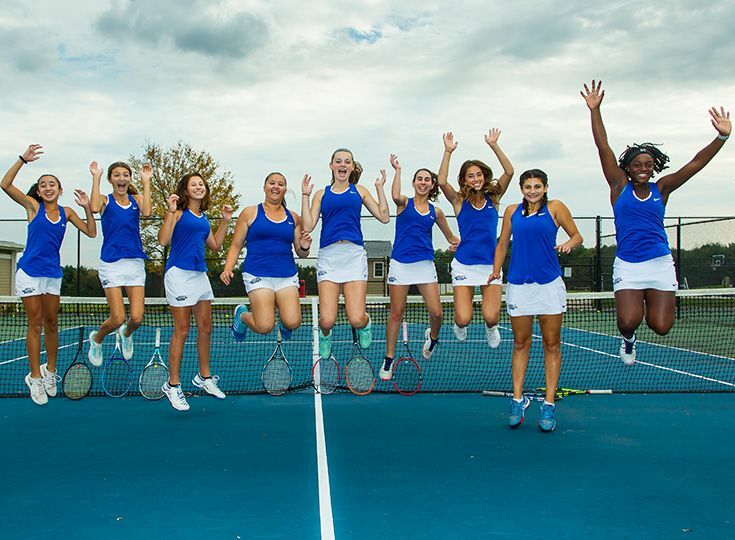 Congratulations to varsity girls' tennis on advancing to the NJSIAA state sectional finals with a 5-0 win over Trinity Hall yesterday. Without a single senior on the roster, this young team has continued to defy expectations with its raw talent and focused play. Currently, the squad ranks #16 in the state. In yesterday's match, the stellar freshman Mayjah Jean-Pierre set the tone, winning 6-2, 6-1 at first singles. The newcomer has posted a phenomenal season, dropping only a single match thus far. At second singles, fellow freshman Ella Baker, notched an equally decisive 6-1, 6-2 win. A veteran of Knights' tennis, Andree Aloise '19 took third singles, 6-2, 6-3. In first doubles, Tori Goldin '20 and Alexis Meola '19 won their match 6-3, 6-3. The duo of Jessica Bleier '20 and Hannah Cohen '19 won 6-2, 6-0 to complete the sweep. On Tuesday October 17, the Knights will host either Ranney School or Moorestown Friends in the state sectional finals at 2:30 p.m.